The arterial geometry (see Fig. 1) used here is an approximation to the image-based geometry found in , with the arterial diameter approximated from  and the wall thickness coming from . The arterial wall (i.e. the structural mechanics part of the problem) is modeled with the membrane element. The numerical methods used in this computation were introduced and implemented on parallel computing platforms by the T*AFSM. 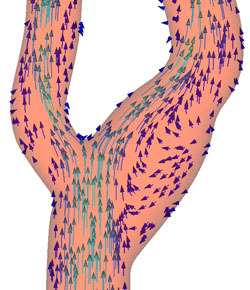 The set of numerical methods introduced by the T*AFSM over the years and used in this computation includes the DSD/SST formulation [4-7], the quasi-direct FSI method [8, 9], the stabilized space-time FSI (SSTFSI) technique , and special techniques for arterial FSI computations . 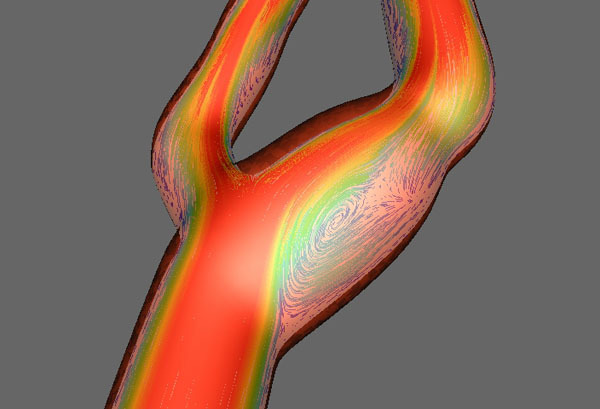 The inflow velocity used in the computation during the cardiac cycle has the same form as that shown at Cerebral Aneurysm -- Variable Wall Thickness, High Blood Pressure. The blood pressure profile is similar to the normal blood pressure profile shown at Cerebral Aneurysm -- Variable Wall Thickness, High Blood Pressure. For more details on this computation, see . Fig. 3. 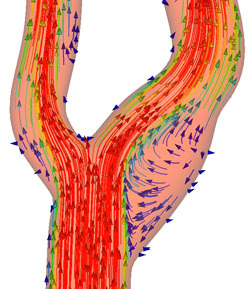 Flow field at various instants during the cardiac cycle. Velocity vectors colored by magnitude. For details, see . 1. N.E. Piersol, S. Lee, W. Kalata, F. Loth, P.F. Fischer, G. Leaf, N. Alperin and H.S. 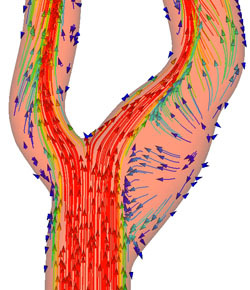 Bassiouny, "Automated Simulation of Velocity and Wall Shear Stress Patterns Inside a Healthy Carotid Bifurcation", http://web.mit.edu/selee/www/menu1/research/healthy_carotid.html. 2. J. Krejza, M. Arkuszewski, S.E. Kasner, J. Weigele, A. Ustymowicz, R.W. Hurst, B.L. Cucchiara and S.R. 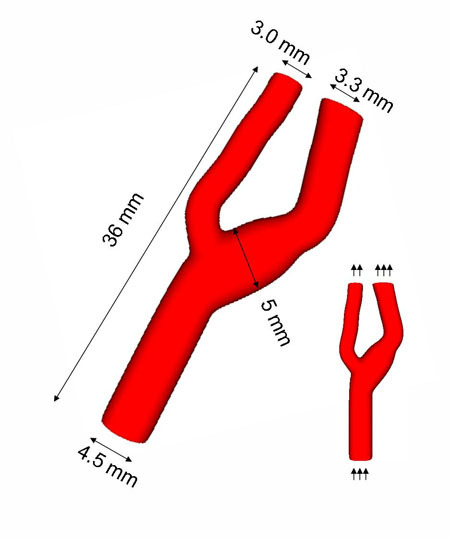 Messe, "Carotid Artery Diameter in Men and Women and the Relation to Body and Neck Size", Stroke, 37 (2006) 1103-1105. 8. T.E. 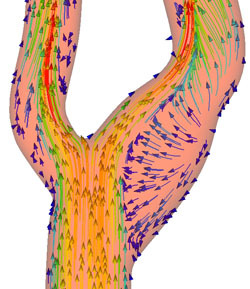 Tezduyar, S. Sathe, R. Keedy and K. Stein, "Space-Time Techniques for Finite Element Computation of Flows with Moving Boundaries and Interfaces", Proceedings of the III International Congress on Numerical Methods in Engineering and Applied Sciences, Monterrey, Mexico, CD-ROM (2004). 9. T.E. Tezduyar, S. Sathe, R. Keedy and K. Stein, "Space-Time Finite Element Techniques for Computation of Fluid-Structure Interactions", Computer Methods in Applied Mechanics and Engineering, 195 (2006) 2002-2027. 10. T.E. Tezduyar and S. Sathe, "Modeling of Fluid-Structure Interactions with the Space-Time Finite Elements: Solution Techniques", International Journal for Numerical Methods in Fluids, 54 (2007) 855-900. 11. T.E. Tezduyar, S. Sathe, T. Cragin, B. Nanna, B.S. 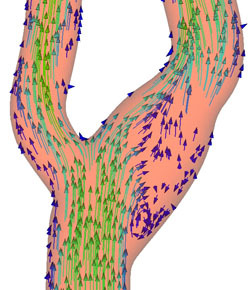 Conklin, J. Pausewang and M. Schwaab, "Modeling of Fluid-Structure Interactions with the Space-Time Finite Elements: Arterial Fluid Mechanics", International Journal for Numerical Methods in Fluids, 54 (2007) 901-922.